Last week, Geoff Brumfiel at NPR wrote a story about my research, with Veli-Pekka Kivimäki, showing that Russia was now deploying the Iskander missile system to Kaliningrad. This is the longer analysis that outlines the evidence that Russia is putting the Iskander in Kalniningrad. Satellite images suggest that Russia is now in the process of deploying the Iskander-M missile system to Kaliningrad. The satellite images, however, show something more than the periodic and temporary deployment for a training exercise. Newly acquired satellite imagery of Russia’s Kaliningrad enclave, posted online by the Center for Nonproliferation Studies to the Geo4nonpro.org website, shows construction occurring at 152nd Missile Brigade in Chernyakhovks that is consistent with the construction that proceeded the deployment of the Iskander to other military units in Russia Specifically, satellite images show footprints for at least five “tent-mobile” shelters of the same dimensions as seen as other Iskander deployment sites. The permanent deployment of Iskander-M to Kaliningrad is now imminent. Based on the status of construction, deployment may have already occurred and the site could be fully operational within a year. Kaliningrad is today Russian territory, having been ceded by Germany to the Soviet Union following the Second World War. There is no treaty or agreement that would prohibit Russia from placing the Iskander where it chooses in its own territory. However, the imminent deployment of Iskander missiles in Kaliningrad raises two concerns. First, Russian officials have repeatedly emphasized the role that the 500 km-range, nuclear-capable Iskander system would play in targeting US missile defense assets in Poland. The United States and Poland held a ground-breaking for the US missile defense site at Redzikowo in May, with the site expected to become operational in 2018. The Iskander deployment allows Russia to target the Redzikowo site, which would have been far harder for the shorter-range SS-21 to reach. Second, the Iskander appears to be at the center for a dispute between Russia and the United States over the 1987 Intermediate-range Nuclear Forces (INF) treaty. The United States has accused Russia of testing a ground-launched cruise missile in violation of the INF Treaty. Most Western analysts believe that the cruise missile in question is the 9M729 intended for the Iskander-K system and has a range similar to the 2,500 km associated with Russia’s Kaliber sea-launched cruise missile. From Kaliningrad, such a missile could strike targets throughout Western Europe including London, Paris and Madrid. Because routine training deployments of the Iskander to Kaliningrad have been reported in the past, we have long monitored both the training ground near Pavenkovo, where many exercises take place, as well as the 152nd Guards Missile Brigade in Chernoyakhovsk. The 152nd Guards operate the SS-21 missile system, which is the system that the Iskander is replacing throughout the Russian Armed Forces. We were able to positively identify both locations by monitoring Russian social media accounts. Russia maintains conscription and many soldiers document their period of service in the military on their camera phones, later posting images to their social media accounts. Former Russian soldiers also maintain contact through alumni groups online, making it relatively easy to identify individuals who have served in particular units. There are a larger number of former soldiers who have published images of the 152nd Guards Missile Brigade in Chernoyakhovsk, making it easy to confirm the location and armaments of the unit at: 54.647°, 21.826°. We monitored these two sites using a combination of high-resolution but infrequent imagery, as well as as moderate-resolution but higher cadence imagery from Planet Labs. In particular, we were interested in whether reports of the Iskander deployment coincided with an exercise at Pavenkovo – in which case, the deployment would likely be temporary – or whether it coincided with construction at the missile base in Chernoyakhovsk to permanently station the missiles in Kaliningrad. Russia has been deploying the Iskander since 2013 to the missile brigades that, like the 152nd Guards, previously operated the SS-21 Tochka. Using English-language and Russian sources, we generated an order of battle for the Iskander. In August 2015, Reuters released a story reporting on a leak about supposed Iskander-M deployments at a number of sites: Luga, Molkino, Mozdok, Birobidzhan, Znamensk (Kapustin Yar), Totskoye-2 and Shuya. In addition to the location of the missile units, the leak describes the construction of equipment shelters at the deployment sites. For many, although not all, of the sites in question Russia is constructing “tent mobile” (Russian: тенто-мобильные укрытия, ТМУ) shelters for the Iskander that provide protection against the elements, but reduce the cost of building and maintaining the facilities. There are are number of images of both the shelters, as well as models showing the layout of some Iskander sites. Left: Tent-mobile shelters for the Iskander at Luga, June 2014 (Source: Russian Ministry of Defense); Right: A model of the Shuya site, with an Iskander in a tent-mobile shelter (Source: Federal Agency for Special Construction). 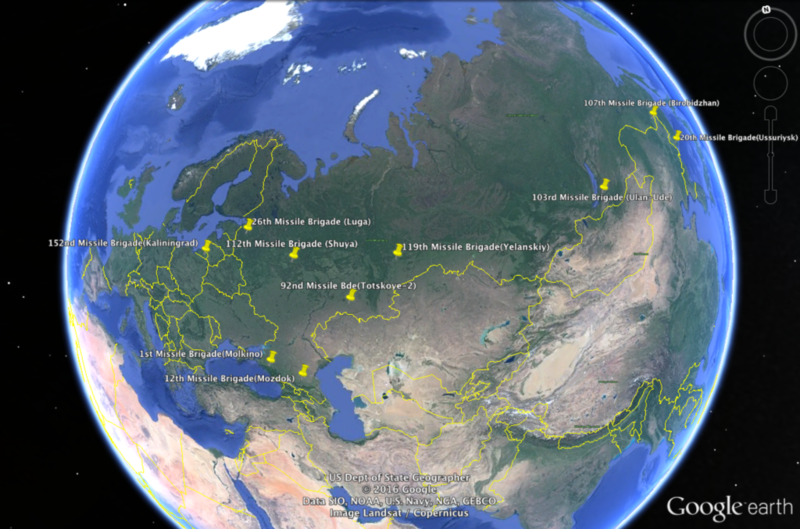 This information allowed us to identify most of the sites associated with the Iskander deployment and verify, on an open source basis, the missile deployments. In general, the Iskander sites exhibit a standard layout and follow a common construction timeline that allows easy verification of the Iskander order of battle using publicly available satellite imagery. Most sites have a distinctive layout that can be seen in these two images showing the 112th Missile Brigade near Shuya. Left: A satellite image from GoogleEarth showing the layout of the shelters at Shuya; Right: A scale model of the Shuya site displayed at a defense exhibition. Working initially with images provided by Planet Labs, we noticed evidence of ground-scarring at the Chernoyakhovsk locating on September 9. This prompted us to consider Kaliningrad as a case study for the Geo4Nonpro site. CNS purchased high-resolution image from October 2016, and posted them online last week. Left: An annotated image from Planet Labs showing the first signs of construction in Septemner; Right: A screenshot of the Geo4Nonpro website showing the footprints. The high-resolution imagery revealed new construction with clearly visible footprints consistent with the early stages of tent mobile construction at other locations like Shuya. The size of the footprints (approximately 50 x 20 meters) is consistent with the size the shelters seen at other sites. Moreover, the Russian Defense Minister recently stated that tent-mobile shelters would be constructed in Chernoyakhovsk. Yelena Morozova, who writes for the Daily Mail, took an undated image of a tent-mobile structure under construction. We were able to geolocate the image and confirm that it shows a tent-mobile shelter under construction at the 152nd Guards Missile Brigade at Chernoyakhovsk, on the footprints visible in the satellite imagery. 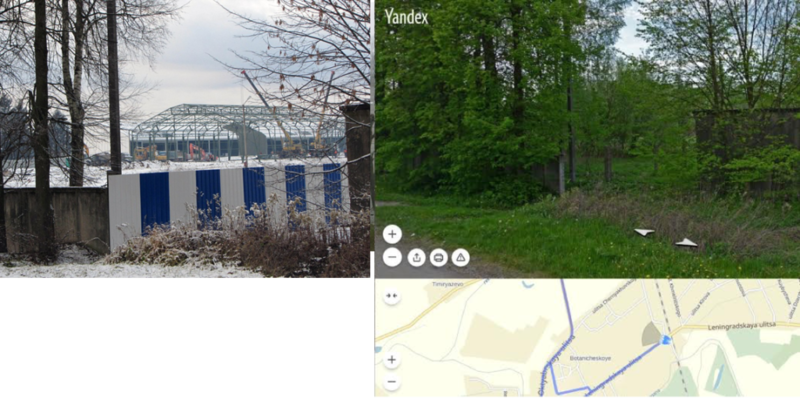 Left: Image of a tent-mobile shelter under construction in Chernoyakhovsk; Right: Streetview from Yandex Maps showing the location is the same at the footprints in the satellites images of the 152nd Guards base. While past reports of deployments involved exercises in the Kaliningrad region, the construction of tent-mobile shelters at the 152nd Guards base in Chernoyakhovsk signals that Russia is now deploying the Iskander on a permanent basis in Kaliningrad. This step is sure to increase tension with Poland, as well as complicate the discussion about Russia’s compliance with the 1987 INF Treaty. *Veli-Pekka Kivimäki is a doctoral student at Finnish National Defence University, researching open source intelligence in the modern information environment. The views and analysis expressed here are solely those of the author in his private capacity and do not necessarily represent the views of his employer. Great Work, Jeffrey – thanks for sharing!